I've been a Jimmy Buffett fan for years. To me there's nothing more relaxing on a hot day than a cool drink, a sea breeze, and Buffett playing in the background. 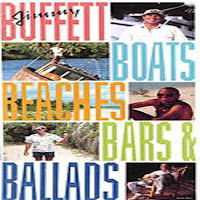 I love the sentiment in so many of his songs - the laid back beach lifestyle. One of my favourites - I have found me a home. We each bought bikes. Mine's blue. John's is black. Missy can ride in the basket (if she wants to). Neither of us had ridden a bike in over 20 years so I waited until no one was around for my first ride in case it went bad. By bad I mean embarrassing. But you know what.... it's like riding a bike. I was a bit wobbly for the first little while then off I went. Bribie Island is flat - no big hills to have to ride up or down so cycling is a great way to get around. Sounds delightful...I haven't ridden a bike in many years, but I'm sure like you, once I sit on the saddle again it will all come back to me. I hadn't heard of JB, so I googled him and as I type this am listening to his song about Margaritaville - love it! I love bike riding but have rotten knees. I developed arthritis in my 30's. But I could manage flat terrain easily. What a wonderful to get around!